Smart children play outside in a cubby house. They don’t play outside because they are smart, they play outside to get smart. Kay Redfield Jamison, noted author and clinical psychologist has been quoted saying, “Children need the freedom and time to play. Play is not a luxury. Play is a necessity.” Play is a child’s job. Through play they learn. When they are stuck in the house watching television or on a video game, they are not using their whole mind and body for unstructured all out creative play – they kind that really gets their brains going. 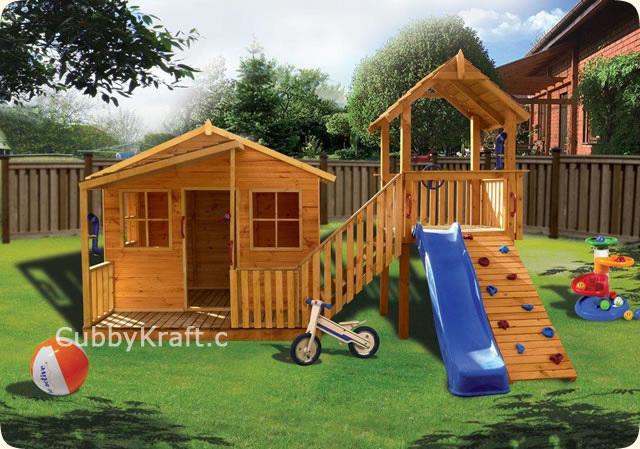 But, when they use their backyard cubby house to sail the high seas in search of a dastardly pirate or looking for treasure themselves, they are getting smarter through play and they want to play because there is a cubby house in their backyard. Play outside stimulates creativity. When kids are go outside, they see a world of things they can play with and use to create fun. Sticks, rocks and open spaces become swords and a castle one day an wizard wands and the Forbidden Forest the next. Outside is a place for the mind to wander and imagine, leading to using your brain to the fullest. Playing outdoors is open-ended. Your kids have no rules to follow when they are out of doors except those that they create in their imaginary role play. While you do not wish them to cross the road, they are okay with that because they are sailing the high seas in their cubby – there are no roads in the ocean. Playing in nature reduces anxiety. Time spent outside physiologically reduces anxiety. Plus, being outside enjoying active play allows the body to use its energy in a healthy fashion, reducing stress and giving kids the exercise they need for a restful sleep. Getting enough sleep is another way to reduce stress. Believe it or not, playing outside in an unstructured play environment will help your child increase their attention span for structured activities like class work. Again, it helps get rid of penned up energy, plus it gives kids practice on focus as they do spend a lot of time focusing on their outside adventures. When kids spend time outside communing with nature, they notice all of the patterns there are. The natural world is full of all kinds of interesting patterns. The petals on flowers, the veins of a leaf, the bark on a tree are all patterns. Pattern building is a crucial early math skill and continues to be one through college math and science.